We would like to introduce you to our new test results report which will provide all patients’ test results in an easy to read and informative document. This new layout will display data that was previously not printed such as the number of antigens tested as well as resolve any confusion of locating sensitivities of products that fall into larger categories such as whey or gluten. 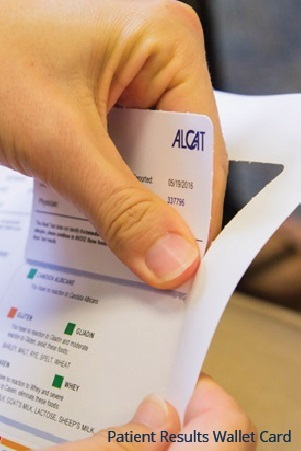 Patients will still be able to see their Alcat Test results in a color coded red, orange, yellow, green pattern for sensitivity displayed at the top of each column above the antigen results. 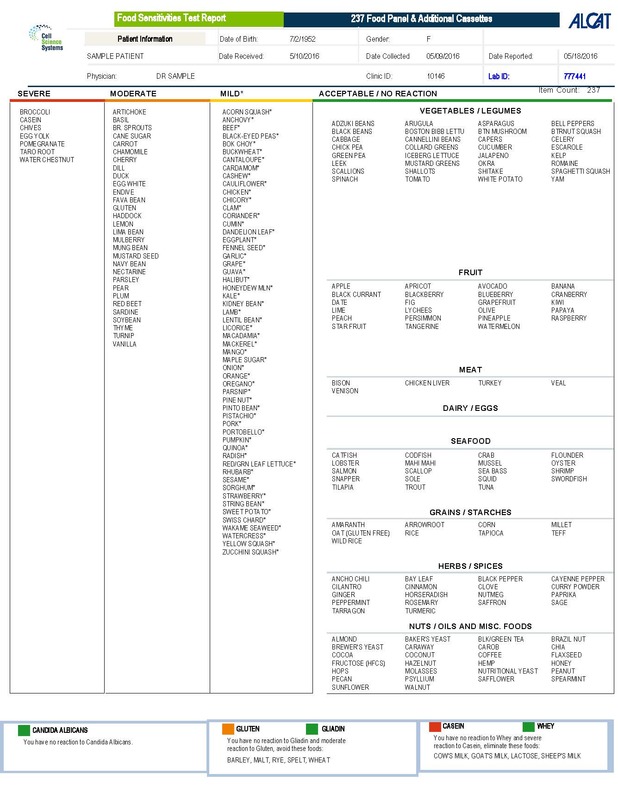 Contained in each result is a 4-day rotation diet and a detailed, easy to read explanation on where to find the foods and chemicals you have been tested against in order to avoid them in your daily eating habits. Some foods will be listed under a different name in the ingredients list which can be confusing to avoid. This expert written explanation for your sensitive foods will provide alternate names and mixes that may contain each food such as parsley in an Italian herb mix. The wallet card has been replaced with a new quad fold card that is still able to fit in your wallet or purse that will contain all your sensitivities on the front with color coded columns as well as containing all your non sensitive foods, green column, on the back. The wallet card can be taken anywhere you go so that shopping trips are easier to remember and at restaurants you can be sure you are avoiding sensitive foods. We have provided two of these cards for your success to stay on track to a healthier self. All of these new and exciting changes will still be provided to each patient in the Understanding Your Alcat Test Results profile. Guidance to understanding any of your results is always provided by our expert nutritionists who provide individual diet and exercise plans to lead you to an overall healthier lifestyle.